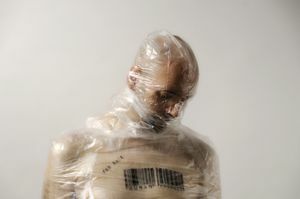 The "Human Products" series is inspired by and expanding upon the Barcode Art of Scott Blake (http://www.barcodeart.com/). In that regard it is a "meta-" art project. 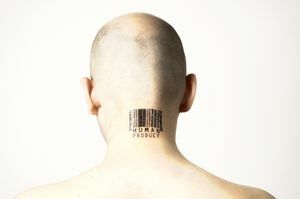 It concerns our functionality in modern society as Human Products that have to "sell themselves" to others as good as possible in order to survive, as well as the obsession with plastic/flawless beauty that turns people into more attractive, and thus more easily "sold", Products (I have opted to use the term "Modoll" for this aspect). The concept of this series of photographs is that of a factory of Human Products (also called "Modolls") with a production line, warehouse, defective or/and old products dump. These photos wouldn't have been possible without the help of Irene Astral (co-creator and model/makeup artist, www.facebook.com/ireneastral) and the lovely models: Danai and Agapi that agreed to pose for these photos.